No Motor(ized) Bikes: Tour De France Unveils New Plan To Catch Cheats : The Two-Way "This problem is worse than doping," French Secretary of State for Sports Thierry Braillard tells a newspaper. 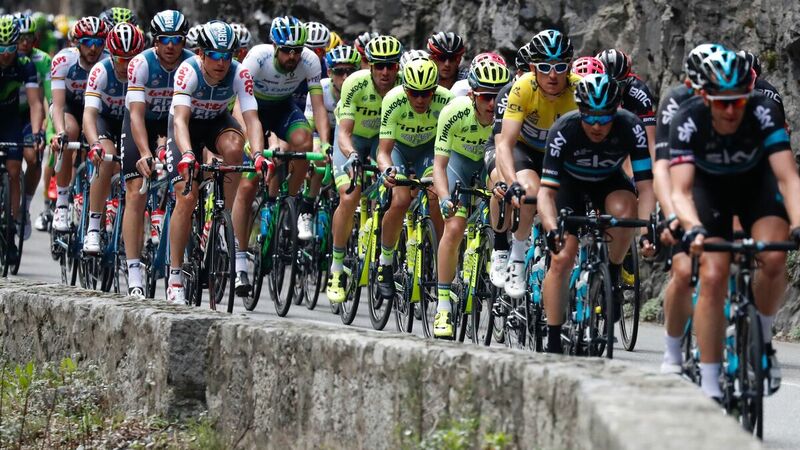 Cyclists in this year's Tour de France will face new controls for what organizers call "technological fraud." Here, elite cyclists are seen riding in the Paris-Nice race in March. Thermal cameras and other tools that can detect "mechanical doping" — small but powerful motors that boost riders' power levels — will be used in this year's Tour de France, in a change race officials announced just days before the prestigious race's start on July 2. "This problem is worse than doping," France's Secretary of State for Sports Thierry Braillard tells Le Journal du Dimanche. "This is the future of cycling that's at stake." The bid to keep professional cycling clean will rely on techniques developed by a large French government agency that also conducts nuclear research. In the Tour de France, the image tests can be done anywhere, officials say — and they add that they won't be publicizing the thermal cameras' locations. The move is an attack on a method of cheating that had long been suspected but wasn't proven at the sport's highest levels until this year. If cycling still had any trusting and faithful fans in January of 2016, the scales fell from their eyes when Belgian Femke Van den Driessche, a promising 19-year-old cyclocross rider, was found to be using a motor during the U-23 World Championships. As far back as at least 2010, accusations have flown that elite cyclists were turning in superhuman performances with the help of motors that are hidden inside their bike's seat tube (the one running from the seat down to the pedals). Commercial versions of such devices can provide a steady power stream of around 200 watts — the lower range of a pro cyclist's average output in a stage race. They can also be set to assist riders automatically if their pedaling cadence falls below a certain threshold. "Developed by the CEA (the French Atomic Energy Commission), the method consists of using a thermal imaging camera capable of detecting mechanical anomalies on the riders' bikes. The checks can be made in the race and on the side of the roads." "Unlike cheating with heavy tube motors, moto-doping via electromagnetic wheels is much more subtle. A series of neodymium batteries are hidden inside the rear wheel, and a coil tucked away below the seat generates an induction force, which gets you 60 extra watts of power. The field is controlled via a bluetooth activator." "Sophisticated motor power is hidden in the bike's seat tube. It only weights 1.8 kg (inkl. battery). Press the button and the motor delivers 200 watts to the crankshaft. Press the button again and the motor stops. "Without motor power the bike functions as normal without any kind of resistance. The Lithium-Ion high-performance battery, which fits into a conventional saddlebag, provides you with motor-assisted cycling lasting for min. 60 minutes (6 Ah) or min. 90 minutes (9 Ah). The special design of the drive unit allows it to be built into any bicycle frame with the requisite seat tube internal diameter of 31.6 mm or 30.9 mm and is therefore invisible on the bicycle – except the on/off switch, which is unobtrusively located on the bar end."